As Marine Corps Times first reported last week, the Corps will soon have a new top enlisted Marine: Sgt. Maj. Mike Barrett, of 1st Marine Division, out of Camp Pendleton, Calif. If you follow the Corps, you know that already. However, very little else has been published in the past about Barrett, a decorated infantryman who earned two Bronze Stars with “V” device for courage in Iraq and served as a scout sniper during the Gulf War. This week, Marine Corps Times’ four-page cover story profiles Barrett, his combat heroism, his leadership style and what he’s done behind the scenes as a senior enlisted adviser. It includes comments from Barrett, who took about 20 minutes out of his whirlwind schedule Friday for a telephone interview from Pendleton. Also quoted in the story are Sgt. Maj. Carlton Kent, the outgoing sergeant major of the Marine Corps, and Maj. Gen. Richard Mills, who recently returned from a year-long deployment to Afghanistan with Barrett. Both leaders offer comments on Barrett that are illuminating. Numerous Marines who served with Barrett in the past also weigh in, remembering him as a company first sergeant, a junior Marine and new battalion sergeant major. 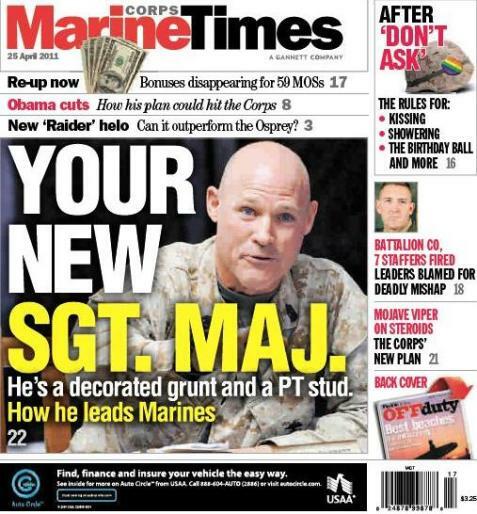 All in all, it should be the definitive piece on the 17th sergeant major of the Marine Corps for some time to come. One footnote: For anyone wondering, yes, Barrett’s full first name is spelled “Micheal.” It has been butchered on dozens of Marine Corps websites over the years, so I wanted to set the record straight right here. Sergeant Major Barrett was one of my Drill Instructors. I learned the most from him. Looking back, he was the one I respected the most, even before I learned about his appointment. A true leader and a Marine that has my highest respect, I would ruck up today and follow him to the gates of hell. Semper Fi and congratulations. Former Sergeant Jeremy Osteen. Plt 2006, Fox company, 2nd RTBN. Graduated June 4, 1993. I served as Cpl Of The Guard at Camp David under (at the time) gunnery Sgt Barret. I must say he is a marine among marines. His actions speak louder then his voice if that is possible. I can recall a time he ran the PFT in his gas mask ya he is hard. He is where he should be at the top. Well, I don’t know SgtMaj Barrett anymore than I know the most recent Marine that just pinned on his Eagle, Globe and Anchor at boot camp, but I’ll say this, anyone that runs the PFT wearing a gas mask deserves to be Sergeant Major of The Marine Corps! ’nuff said! Semper Fidelis. SGTMJR. Barrett was my son SGT. Matthew E. Mendoza, His SGTMJR. when he was with 2/7. I never had the chance to meet the SGTMJR. But from what I know from our son Matthew, And his former SGTMJR. Brookshire. He is a very good man and an outstanding Marine I know he will do great things for our Marines and the Corp they serve.